With over 25 years of experience, Landscape Creations is one of the most established landscape design and landscaping installation companies in the Chicago area. Located just west of I-355 at North Avenue in Lombard, we service many areas in DuPage County including Lombard, Glen Ellyn, Wheaton, Carol Stream, Emhurst, Naperville, Bartlett, Winfield and Glendale Heights. If you are looking for an expert Chicago landscaper who provides great service, has a quality reputation and is independently recognized by the Chicago Area Better Business Bureau, give us a call to discuss your needs. We offer residential landscaping services which provide distinctive landscape designs that many other Chicago landscapers cannot match. 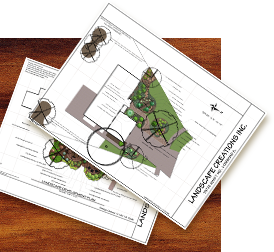 Our approach is simple: we listen to your ideas, make suggestions regarding your unique landscaping needs and come up with the most effective plan to get the job done in a cost efficient and timely fashion. Please visit our landscaping portfolio to view some our recent work and these images may also help you develop ideas for your own outdoor paradise. We’ve been building great landscapes for 25 years plus. If you’re looking for a customized landscape design solution and want to turn the ordinary into the extraordinary, contact Landscape Creations today.